After the deep recession in 2009, signs of an incipient upturn are to be seen in Hungary. Recovery is driven by net exports, resulting in a considerable increase in the trade surplus. 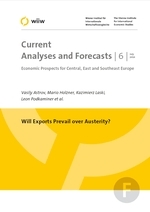 In the forecast period 2010-2012, it is assumed that economic growth will slowly accelerate, initially driven for the most part by net exports. From 2011 onwards, however, the driving forces will also be modest expansion of consumption and a more articulate expansion of investments. Limited scope for government-initiated demand management in the domestic market and the possible negative impacts of fiscal consolidation in Hungary's main export markets pose a downside risk to growth.